Many people experience a defining moment that shapes what they will become. While I was teaching at an urban alternative high school, that moment came for me when a student screamed a string of expletives in my face. Standing there, armed with my master’s degree and ten years of classroom experience, it struck me that I was no longer teaching, honing the craft I loved and was dedicated to. At this juncture, I literally did not know who I was, not only in terms of my vocation but also in terms of my overall identity—especially my identity as a Christian. My Christian upbringing, devotion to Christ and His teaching, and my K–12 education in Catholic schools provided a background that prepared me to be intentional in the spiritual formation of my students, even in a public school setting. Knowing that the spirit of Jesus Christ resides in each one of my students is the position from which I had always approached teaching. In fact, it had been the hallmark of my teaching up to that point. It was the foundation from which I drew strength when faced with the daily challenges of teaching in a public school. However, I had been rubbed raw by the first few weeks of the new semester, and on this occasion, I was left debased by the defiance displayed and the humiliation I had endured at the hands of this student and her peers; I was ashamed and embarrassed as my authority crumbled and my identity was stripped away. I tried to draw from my foundation of faith, keeping in mind that God is more interested in making my lifework His discipleship than He is in making my life easy. But I was shaken, shaken to the core, and shaken loose from the belief that Christ was there, guiding me. Many educators would agree that teaching is a profession in which personal identity endures assault but not necessarily an ultimate destruction and breakdown. I knew that exploring my identity as a teacher required understanding the connection between emotion and self-knowledge (see Zembylas). 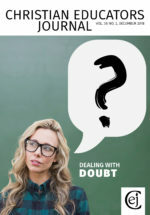 Even with this understanding, I was on the cusp of an identity crisis, fully aware there was a disconnect in my emotions, faith in Jesus, and self-knowledge. The setting of this revelation was a New York State public school euphemistically termed an “alternative high school” (AHS) that housed students who had been expelled from traditional school or who were mandated by court to attend as an alternative to jail. I had taken the job because I was up for a change and a challenge. I was not naive about the needs of these students. I had lots of teaching experience and, more importantly, a strong faith in God’s presence and love to guide me. Nevertheless, I discovered I was naive about the fragility of my identity as an “authority” in the classroom when my role as a respected leader collapsed. Everything I had learned about myself as an educator and my tools for teaching and managing a classroom were ineffective in this environment. The students were mostly from racial minorities and also happened to be mostly impoverished, neglected, and unsuccessful in many aspects of life. I was a well-educated, Christian, middle-class, white woman who had entered the classroom as successful, confident, privileged, and still trusting of public education. A few weeks into the semester, I felt disempowered, humiliated, and frustrated. Why had Christ led me down this path if he knew I would be driven to quit, a failure, full of anger, despair, and feelings of inadequacy? Rachel Adams Goertel is an assistant professor of education at Roberts Wesleyan College. Her scholarly work focuses on linguistics and second language acquisition. Rachel is an amateur ornithologist, loves to read historical fiction, and can often be found fishing with her husband, James, and their young son, Henry.